The competition is really heating up on Season 16 of DANCING WITH THE STARS as we are heading into the Finals next week. Last night the remaining six couples battled it out and danced two dances. After last night’s performances tied at the top of the leaderboard are Aly Raisman and professional dancer Mark Ballas and Jacoby Jones and professional dancer Karina Smirnoff. At the bottom of the leaderboard are Ingo Rademacher and professional dancer Kym Johnson. Did you watch last night’s show? We did and we recapped it here for you. On last night’s show each couple perform two routines, inching their way one step closer to the coveted mirror ball trophy. One of the dances will be a dance that twitter users voted on. It will be either a Flamenco, Charleston, Afro Jazz, Lindy Hop and Hip Hop. The second dance will be a ballroom or Latin style dance they have yet to perform this season. There were some really good performances last night especially during the dances that the viewers chose. In my opinion the dance of the night was Jacoby Jones’ Lindy Hop. Len said, “It was high energy, full on and action pack. It was fabulous, well done!” Bruno said, “You got everyone powered up including me, you nailed it.” Carrie Ann said, “I dub you the number one entertainer of season 16″ Followed a close second by Kellie Pickler’s Flamenco. Len said, “I tell you what you are small but your talent is huge. You just booked your place in the finals.” Bruno said, “You really got it, there were a couple of minutes you tightened it up. In the flamenco you cannot.” Carrie Ann said, “You looked so beautiful. But I agree you tensed up. Towards the end. Logic dictates that one of the couples with the lowest scores – Ingo Rademacher and professional dancer Kym Johnson – will be leaving the competition. However, no matter what the judges says, at the end of the day, the competition comes down to your vote at home. Who should leave? Vote in our trusty poll and let us know in the comments below which couple you think should be going home tonight. 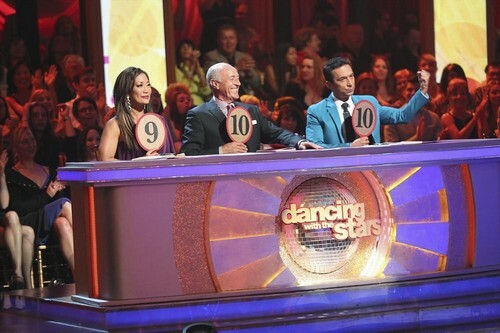 Who Will Be Voted Off Dancing With The Stars Tonight?